This post continues my tutorial revisiting the famous “Artificial Anasazi” model of Axtell et al. (2002), ported to NetLogo by Marco Janssen in 2008 (see his paper). I have rewritten the model for explanatory purposes (though very much inspired by Janssen’s work). Part 1 of the tutorial looked at the patch dynamics, and we now turn to modelling the people. The model studies the population of Anasazi farmers living in Long house Valley (near Black Mesa in Arizona) between 800 and 1350 AD. 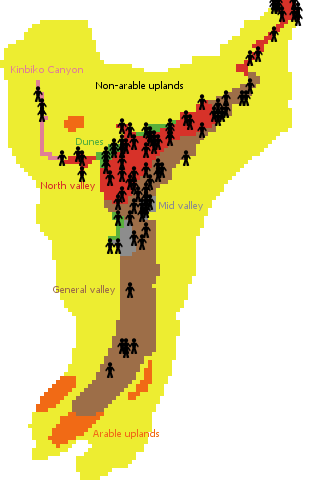 The image below shows the NetLogo view of this valley, as modelled for 1000 AD, with each person representing a household. For purposes of simplicity, I am not modelling the availability of drinking water and the locations of dwellings. The locations of the people on the diagram below therefore represent farm locations. However, because I am not modelling water availability and dwelling locations, the spatial distribution of people should not be taken too seriously – I am only hoping to accurately model population numbers. The earliest age that a household can reproduce (spin off a daughter household) is 17 (at which time the mother is aged 33). Fertility is assumed to continue to age 36 (based on the discussion in Axtell et al. ), which means that the latest possible daughter household is produced at a household age of 36. Matriarchs are assumed to die after age 54, so that the oldest possible household is 38 years (which is perhaps a little old for a society of this kind). Households must make certain decisions. Initially, and in times of famine, they must choose a (new) farm. We introduce a reporter (function) to return an estimate of the productivity of a farm (patch). This reporter will be used twice, so it is good practice to give the calculation its own name. The result of the reporter is in fact just be the base yield of a patch, but we could expand it to incorporate historical information and/or decision errors. Giving the calculation its own name makes it easier to include such extensions down the track. The following reporter picks out the best farm from an agent set. If there are no suitable farms, the household is assumed to leave the valley, which is equivalent (from a model point of view) to dying. But what is the “best farm”? The matrilocal structure means that agents try not to move very far (i.e. they select a low distance from their existing location), but we also introduce a slight bias towards a high estimated farm yield (minimising 1000 / estimated-farm-yield). The NetLogo built in min-one-of operator does the hard work of finding the patch with the lowest combined score. Incidentally, for distances to be calculated correctly, the NetLogo world must be set to not “wrap” either horizontally or vertically. According to the archaeological record, the population of the valley began with 14 households. We can initialise them with the code below (which assumes that households are what NetLogo calls a “breed”). We use a utility procedure initialise-household to set various attributes. This procedure takes a starting age as a parameter. Starting ages run from 0 to 28, but we will use the same procedure later for new-born households, which will always start with an age of zero. We also give each household an initial list of corn storage stocks, divided into ages of 2, 1, and 0 years. The oldest corn (at the front of the list) will be eaten first, and corn older than 2 years will be thrown away. The NetLogo built in n-values operator generates a list of the required length, calling random-float three times. Closely related code allows a household to reproduce. For efficiency reasons, we pass the set of potential farms as a parameter. The NetLogo built in hatch operator allows an agent to create other agents. We also use the NetLogo built in map operator twice – once to generate a list of gift corn, with each entry being one third of the parent household’s list; and once to subtract the entries in the gift-corn list from the corresponding parent household’s list (as a general rule, if a list is being transformed to another list of the same length, the map operator usually provides the most elegant NetLogo solution). We can now provide the code for a simulation step, although annual-household-activities and plot-interesting-data still need to be defined. There are two ask loops. In the first loop, agents set off in search of a new farm if they predict that their corn stocks (plus their expected future harvest) will not meet their annual food requirements (plus a 10% margin). 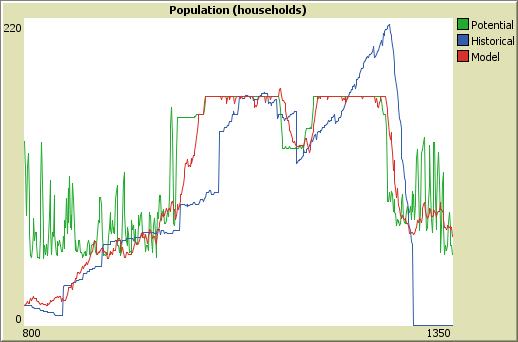 In the second loop, households of fertile age reproduce with a probability given by the fertility slider. A local variable stores the result of the potential-farms calculation, to avoid recomputing it unnecessarily. We set up a global variable harvest-list to be a list of this year’s harvests (this will later be plotted as a histogram). We supplement the spatial variability in farm quality with a temporal variability in annual harvests, re-using our apply-variability reporter. We maintain the household’s 3-element list of corn by dropping the oldest corn at the front, and adding the new harvest to the back. 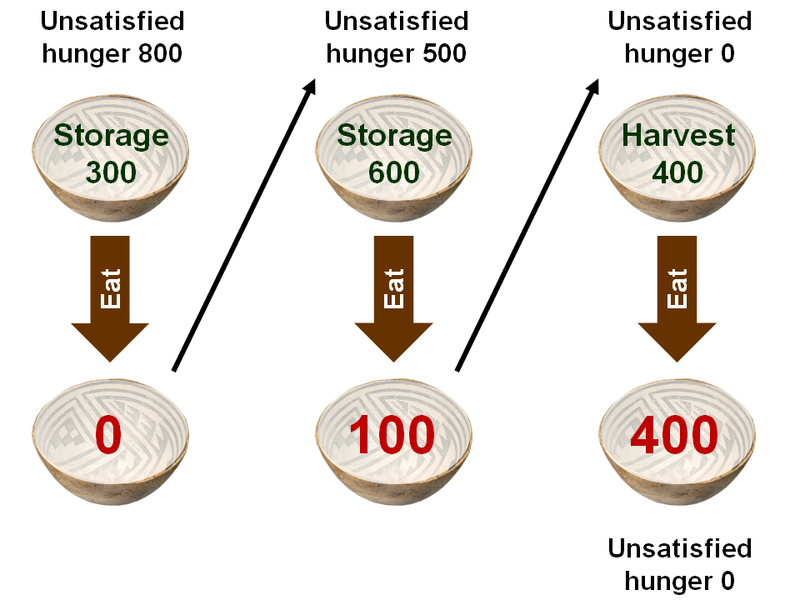 We introduce a household attribute unsatisfied-hunger to process the food that the household needs. We use a NetLogo trick to eat corn starting from the front of the list, using the eat-corn reporter (below). The following code handles plotting and statistics. We use plotxy so that our x-coordinates can start at 800. We plot histograms of household ages and our previously calculated harvest-list (we don’t use the obvious [ harvest ] of households because that would exclude households that starved to death, and would also include new daughter households that have no harvest yet). Unfortunately, histograms in NetLogo require explicit control of the x axis, which adds some complexity. We also maintain a list of population levels in population-sequence, and calculate how well this fits the historical sequence (excluding the proportion of the historical sequence where the population is zero). We measure fitness using the root-mean-square of differences between the two sequences (the aquare root of the mean of the squares of the differences). This is equivalent to using what the literature calls the L2 norm (which penalises large errors), but is expressed in units of numbers of households, which is easier to understand. Values of the root-mean-square error tend to be around 30, which means that “typically” the model differs from the archaeological reality by about 30 households. 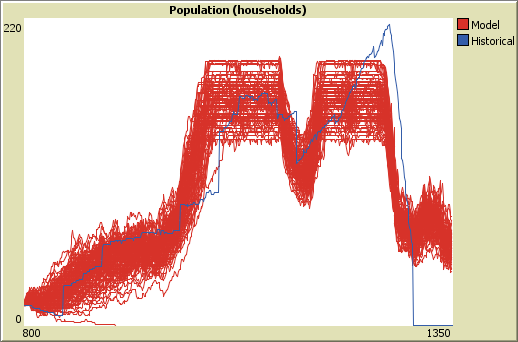 A typical plot is shown below (simulated population levels are in red). The root-mean-square error here is 25.963, which is quite good. Our decision to introduce the usable-farm-fraction slider is partially responsible for this, since it limits excessively high populations without unduly restricting low populations. The entire setup procedure has now been described. For completeness, here it is in its entirety, together with the declarations at the top of the program. The full NetLogo program is at Modeling Commons. Most of the parameters for this model have been given plausible values determined by the literature. 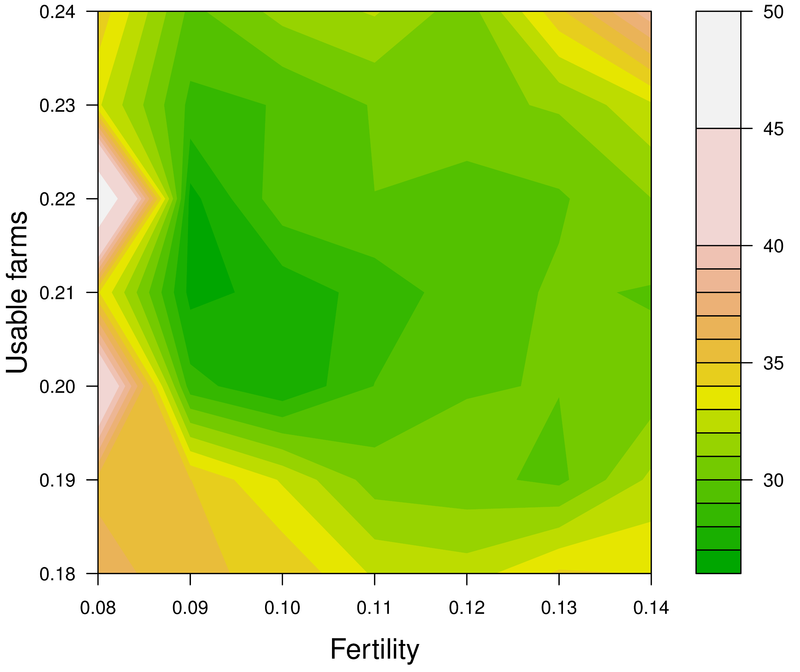 The fertility and usable-farm-fraction sliders, however, are adjusted to maximise the quality of fit between the model and archaeological reality, and we need to take a closer look at these. The diagram below shows root-mean-square errors for various parameter combinations, averaged over ten runs each. A good value for usable-farm-fraction is 0.21. A fertility value of 0.9 generally works well, since it gives a realistically slow population rise, but occasionally it can lead to the population dying out. A value of 0.1 performs almost as well, and is somewhat safer. It is also not far off the value of 0.125 suggested by Axtell et al. The graph below shows 100 runs of the model (red), compared to the historical data (blue). It can be seen that, in one of the runs, the population dies out early. The other 99 runs follow the historical record reasonably well, however. This model begs for extension, of course. Not just by restoring the water availability and dwelling location factors I have excluded – the quality of human decision-making could also be improved. The difficulty is that land-use models generally rely on surveying and interviewing farmers in order to reveal their decision processes. The Anasazi are no longer available for such investigation. However, even the simplified model we have presented here has succeeded in replicating the population variation in Long House valley over time. The exception, as Axtell et al. point out, is the final 50-year period. Archaeology shows that the valley was deserted around 1300, but in fact a reasonable population could have survived. Some other factors must have been in operation to cause the mass exodus that occurred. Plausible guesses about those factors could also be included in the model.